The purpose of the Glenelg Hopkins Fishery Management Plan is to specify the objectives, strategies and actions for managing fishing activities within the Glenelg Hopkins Fishery. The Glenelg Hopkins Fishery includes all inland waters (as defined in the Fisheries Act 1995) in the area administered by the Glenelg Hopkins Catchment Management Authority. The fishery, for the purposes of this managment plan, does not include commercial bait and eel fishing as these are managed through commercial licensing processes for bait, and additionally for commercial and recreational take of eels through the Victorian Eel Fishery Management Plan. The Glenelg Hopkins Fishery Management Plan prescribes fishery management arrangements in accordance with a nationally agreed framework for applying the principles of Ecologically Sustainable Development to fisheries. The Glenelg Hopkins Fishery Management Plan describes: the main fishing waterways and key recreational target species; current management arrangements for recreational fishing activities; goals, objectives, performance indicators, targets and actions for management of recreational fishing activities; and processes for participating in management of other relevant issues, to ensure possible negative consequences to fish habitat are identified and responsible agencies notified. In view of the lack of detailed information on recreational fishing and key fish habitats in the Glenelg Hopkins Fishery, most existing fishery management arrangements will initially remain unchanged while the focus is on establishing programs to monitor fishery trends and the status of key target species. Recruitment of research angler diarists for black bream and estuary perch in the Hopkins River and Glenelg River estuaries, and mulloway in the Glenelg River estuary. Hopkins Fishery, to allow for the number of fishery monitoring programs to be adjusted in response to changes in fishing pressure. Implementation of a monitoring program to assess the sustainability of the current recreational harvest of Glenelg spiny crayfish. Literature review of the habitat and environmental conditions required to sustain the production of black bream, mulloway, estuary perch. Collection of information on in-stream and riparian habitat data for Glenelg spiny crayfish. Ongoing stocking of fish in support of recreational fishing in suitable waters. Continue implementing the Glenelg River Carp Management Plan as appropriate, and participate in its review in 2006. VRFish to liaise with anglers, land managers and water authorities to identify and lodge applications for new, or upgrade of existing boat launching facilities; seek improvements to road and track access to fisheries resources; and actively represent anglers' interests in the decommissioning of Konongwootong Reservoir. If information from the above programs indicates a need to alter fishery management arrangements in the future to ensure sustainable use or to meet changing demands for recreational fishing opportunities, then changes will be considered in consultation with stakeholders. Annual progress reports and a five-year review process will allow fishery management arrangements for the Glenelg Hopkins Fishery to be adapted to changing future circumstances, ensuring sustainable use of fisheries resources with optimum economic and social benefits to the community. A Glenelg Hopkins Reference Group will be established to work with the Department of Primary Industries to deliver the desired management outcomes for the Glenelg Hopkins Fishery. It is proposed that the Glenelg Hopkins Reference Group include representatives nominated by VRFish, Fisheries Victoria and the Glenelg Hopkins Catchment Management Authority. The Fisheries Division (Fisheries Victoria) of the Department of Primary Industries (DPI) is responsible for ensuring Victoria's fisheries resources are sustainable managed. A key task in sustainable management is the development and implementation of fishery management plans. Fishery management plans specify the objectives, strategies, actions and performance measures for managing fishing activities in accordance with the principles of Ecologically Sustainable Development (ESD). Apart from eel fishing (which is managed through the Victorian Eel Fishery Management Plan) and a small commercial bait fishery, the primary fishing activity in Victoria's rivers, tributaries, freshwater lakes and some estuaries is recreational fishing. As such, inland fishery management plans focus on managing recreational fishing activities with the aim of enhancing social, environmental and economic outcomes. Inland fishery management plans also recognise the importance of fisheries resources to Indigenous communities. Effectively managing inland fisheries requires the implementation of appropriate fisheries management tools (eg bag and size limits), but also a recognition that other anthropogenic activities in the catchment are equally, if not more important, in sustaining fish stocks. Therefore, inland fishery management plans must be prepared with a strong focus on establishing partnerships with relevant catchment and water management agencies. The Glenelg Hopkins Catchment Management Authority (GHCMA) is one of 10 Catchment Management Authorities that have responsibility for managing catchments and waterways in Victoria, which is achieved through the development and implementation of Regional Catchment Strategies and their substrategies, Regional River Health Strategies (RRHS). In order to create effective alignment of catchment and fishery management strategies, and the efficient delivery of management actions, the Glenelg Hopkins Fishery Management Plan (GHFMP) has been aligned with the boundaries of the GHCMA. The GHFMP specifies the goals, objectives, strategies, actions and performance measures that will be used to manage fishing activities in the Glenelg Hopkins Fishery over the next five years. The process used to prepare this management plan was guided by the Fisheries Act 1995 (the Act) and overseen by a steering committee (Appendix 1). Details of the planning process are outlined on page 17. The goal of the GHFMP is to manage fisheries resources of the inland component of the Glenelg Hopkins Region in accordance with ESD principles. This includes identifying the habitats and aquatic environments on which fisheries resources depend, and enhancing the social and economic benefits to all Victorians. The Glenelg Hopkins Region lies in the south west of Victoria covering an area of over 25,000 km2. The region stretches between Ballarat in the east and the South Australian border in the west, and between the towns of Ararat and Harrow in the north and the coastline of Victoria in the south (GHCMA 2004) (Figure 1). Volcanic activity from millions of years ago has played a significant role in defining the contours of the region, including shaping the path and location of many rivers, tributaries and natural lakes. The waterways of the region are sustained by relatively consistent rainfall when compared with other regions in Victoria and Australia. Average yearly rainfall is 700 mm/year, with higher averages generally occurring near the coast. Approximately 81% of the Glenelg Hopkins Region has been cleared for agricultural industries (www.glenelg-hopkins.vic.gov.au), particularly for the farming of sheep, beef cattle, cropping and dairying in the higher rainfall areas in the south. These staple primary industries are now complemented by the production of grapes, herbs, cut flowers and plantation grown timbers. The Glenelg Hopkins Region had a population of 95,850 in 2001, with most of these people living in, or near, townships such as Warrnambool, Portland and Hamilton. The people of the Glenelg Hopkins Region value the waterways and surrounds, and participate in activities such as fishing, boating, waterskiing, canoeing, bushwalking and camping (GHCMA 2004). To more easily identify and describe issues, the Glenelg Hopkins Region has been divided into the following fisheries management units. These fisheries management units provide a balance between representing an area at a scale fine-enough to allow for the easy detection of issues; providing enough scope for common issues to be grouped together and addressed by a strategic approach; and recognising other agencies' models of investment (particularly the GHCMA) to allow the establishment of partnerships for management outcomes at common geographic scales. Management units are being used as a tool to assist in the identification and prioritisation of issues at a strategic level. Management units will not be used as a vehicle for introducing different fishing regulations at smaller spatial scales within the inland waters of the Glenelg Hopkins Region. Therefore, the need for detailed descriptions of boundaries (eg between estuarine and the freshwater parts of rivers) is largely redundant and are not provided in the GHFMP. The Glenelg River, Portland Coastal Basin Rivers and Hopkins Basin Rivers management units include the freshwater parts of rivers and creeks only, as their estuarine sections are included in the Estuaries management unit. The following sections provide information on the recreational fishing species for each management unit. Information has been obtained from the Guide to Inland Angling Waters of Victoria (http://www.dpi.vic.gov.au/angling/), reports from Fisheries Victoria regional staff and through public consultation undertaken during the development of the GHFMP. These information sources were also used to provide a basic qualitative description (low, medium or high) of the likely fishing effort. The Lakes management unit refers to all naturally formed static waterways that support, or have supported, fish species targeted by recreational fishers across the Glenelg Hopkins Region. Some lakes have experienced periods of low water levels, but have been listed in recognition of the opportunities that they might provide upon the return of water to these areas. The most popularly fished lakes and the key recreational target species are described in Appendix 2. Licensed commercial fishing for short-finned eels occurs in most lakes within the region. The harvest of eels is of particular importance to Indigenous communities. The Lakes management unit also includes waterways managed as part of Fisheries Victoria's Family Fishing Lakes. This program stocks ongrown trout into selected urban lakes and ornamental ponds that allow easy access for young and disabled anglers in close proximity to regional centres. 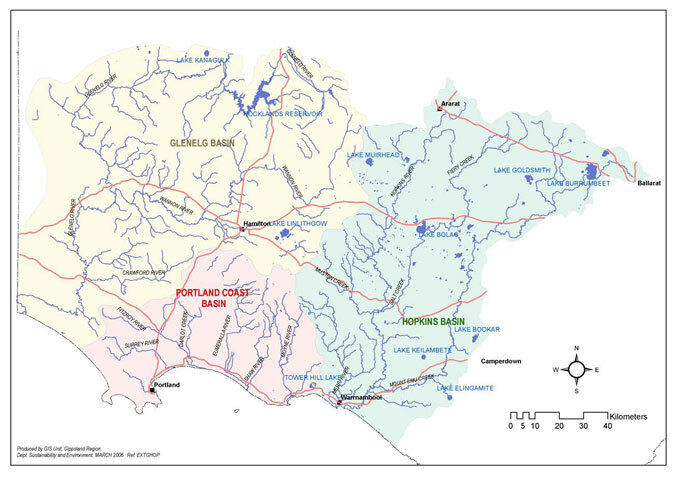 Small Waters in the Glenelg Hopkins Region are detailed in Appendix 3. Impoundments of the Glenelg Hopkins region includes those artificially formed static waterways that support, or have supported, fish species targeted by commercial or recreational fishers. The impoundments and key recreational target species in this management unit are detailed in Appendix 2. The most popular impoundments for recreational fishing are Aringa Reservoir, Hamilton Lake, Konongwootong Reservoir and Rocklands Reservoir. Wannon Water currently manages Konongwootong Reservoir as a potable water supply for the town of Coleraine. Wannon Water will decommission the reservoir in the next three to four years. The recreational fishing value of this waterway will be recognised during the decommissioning process (page 29). Carp were discovered in Rocklands Reservoir in 2000 and are now the subject of a Carp Management Plan prepared by the GHCMA (page 15). Estuaries within the Glenelg Hopkins Region include the Glenelg River, Portland Canal, Surry River, Fitzroy River, Yambuk Lake (including Eumerella and Shaw Rivers), Moyne River (including Belfast Lough), Merri River and Hopkins River. The estuaries of the Glenelg Hopkins Region support a diverse range of fish species. The key recreational target species include black bream, mulloway and estuary perch. Other species targeted by anglers across the different estuaries are detailed in Appendix 4. The seaward boundary of each estuary is described by the extent of inland waters in the Act (Definition of the fishery, page 19). The inland limits of each estuary (beyond which the river is considered to be freshwater) have not been described. The types of fish species found within an estuary are often influenced by the opening and closing of the estuary entrance. Estuaries will often naturally close during periods of low flow, resulting in sand build up at the estuary mouth. The sand bar that forms prevents the mixing of estuary water with the sea. The sand bar can be breached naturally, which occurs when pressure builds from increasing water levels behind the bar, or artificially by mechanical equipment such as excavators (GHCMA 2004a). Many of the estuaries of south-west Victoria, particularly the deeper ones, undergo stratification due to a difference in densities between freshwater and saltwater. These estuaries are often described as "salt wedge" estuaries. During winter and spring, very high flows of freshwater move down the rivers, which push out and replace the salt water (or mix with any remaining saltwater and reduce its salinity), creating a water column with a uniform distribution of low salinity water. Once the freshwater flood flow decreases, the incoming tidal seawater (that has a higher density) slides in under the freshwater and remains separate from it. The thickness of this salt wedge and its distance upstream will fluctuate depending on differences in the amount of fresh or salt water entering the estuary. As the saline water does not easily mix with the fresh water above, it has no means of getting oxygen from the surface. Over time, biological activity within the wedge will use up the available oxygen and it will become totally anaerobic. The re-formation of the salt wedge (after it has been flushed out from high river flows) is an important part in the reproductive cycle of black bream (Sherwood & Backhouse 1982). Some estuaries of the Glenelg Hopkins Region have wetland habitats that are environmentally significant and are listed in the Directory of Important Wetlands in Australia (http://www.deh.gov.au/water/wetlands/database/ directory/vic.html#vicsummary). The directory is aimed at raising public awareness of wetland sites and provides a basis for land managers and the community to undertake actions that will contribute to the conservation of wetlands. The directory lists approximately 150 wetlands of which 22 occur in the Glenelg Hopkins Region. These include the Glenelg estuary, Lower Merri River wetlands, Yambuk wetlands and Glenelg River. Recreational fishing effort is relatively high in most estuaries of the Glenelg Hopkins Region. Some anglers in the region have reported an increase in fishing pressure in the estuaries due to a lack of opportunities in inland waters as a result of drought conditions. Estuaries of the Glenelg Hopkins Region are of high value to Indigenous communities. The Glenelg River management unit includes the Glenelg River (the largest river in the region), Stokes River, Chetwynd River, Wando River and Crawford River. The rivers and tributaries of this management unit support numerous fish species, including the recreationally targeted redfin, river blackfish, yabbies and Glenelg spiny crayfish. Below Rocklands Reservoir, the Glenelg River and tributaries also have populations of brown trout and short-finned eel. In 2001, small numbers of carp were discovered in the Glenelg River below Rocklands (Carp Control page 15). A population of Australian bass (Macquaria novemaculeata) resulting from an unauthorised translocation has also been detected in the Glenelg River below Rocklands Reservoir. Australian bass are non-indigenous to this area of Victoria and pose an environmental risk. Angler access to some rivers can be limited, for example the Glenelg River between Fulham Bridge and Dergholm, due to large tracts of private property that border the river. Recreational fishing effort is considered to be low to medium for most rivers of this management unit. The Wannon River is the second largest river in the Glenelg Basin. A number of tributaries flowing from the Grampians National Park feed the early stages of the river as it flows through low forest and farmland before reaching Nigretta Falls where it enters the Glenelg River. The upper sections of the river have limited flows during some periods of the year, often during summer, but there are usually enough pools to support populations of redfin, brown trout and river blackfish. Populations of Macquarie perch were stocked between Nigretta Falls and Wannon Falls in the 1920s and reports in the 1990s suggest that a population still exists. Macquarie perch are indigenous to the tributaries of the Murray-Darling system and are a relatively rare freshwater species that has been listed as endangered under the Flora and Fauna Guarantee Act 1998. Although they can be taken from some waters, a Governor in Council order does not allow them to be taken from the Wannon River. Recreational fishing effort in the Wannon River is considered to be medium. The Portland Coastal Basin covers an area of 3,995 km2. Almost the entire Basin is a flat plain of volcanic rock with a coastal strip of dune complex. Land use is primarily grazing and broad acre cropping. The Surry River, Fitzroy River, Darlots Creek, Eumerella River, Shaw River and Moyne River are the main freshwater rivers in this basin. Most rivers of the Portland Coastal Basin are in poor environmental condition having limited riparian vegetation, elevated nutrients and problems with salinity (Mitchell 1990). Freshwater sections of these rivers support populations of short-finned eels, tupong and river blackfish. Some of the rivers also support small populations of brown trout. The rivers of the Portland Coastal Basin are highly valued by Indigenous communities. Apart from the Moyne River, recreational fishing effort is considered to be low in most of the rivers. The Hopkins Basin covers an area of 10,096 km2 and includes the Hopkins River and the regularly fished tributary, Mt Emu Creek. The basin also includes the independent waterway of the Merri River. The Hopkins River starts near Ararat and finishes as an estuary at Warrnambool, having a total length of nearly 260 km. The freshwater sections of the river support populations of short-finned eel, redfin, river blackfish and brown trout. Mt Emu Creek begins to the north of Beaufort and travels the length of the Basin until it meets the Hopkins River above Warrnambool. Fish species targeted by anglers include brown trout, redfin and short-finned eel. The Merri River is located in the south-west corner of the Hopkins River Basin. The Merri River begins near Penshurst and finishes as an estuary in Warrnambool. The freshwater sections hold populations of brown trout, short-finned eel, river blackfish and redfin. Most rivers in the Hopkins Basin are in poor environmental condition, mostly as a result of extensive land clearing practices (GHCMA 2003). Most rivers have little riparian vegetation and have elevated salinity, sedimentation and nutrient levels. Recreational fishing effort is considered to be low (in upper reaches) to medium (in lower reaches) of rivers in this management unit. Black bream is an endemic species, which inhabits estuarine waters of southern Australia to Western Australia (Kailola et al 1993). Black bream may be found inhabiting rocky river beds around structures and snags and may be caught over seagrass, mud and sand substrates (Kailola et al 1993; Cashmore et al 2000). Black bream are rarely found at sea, although adult black bream are known to undertake migrations between estuaries (Hall 1984). Adult black bream are considered to be opportunistic feeders primarily utilising bivalve and gastropod molluscs, prawns and crabs, polychaete worms and other small demersal fish (Rigby 1982; Kailola et al 1993; Cashmore et al 2000). Larvae and small juvenile black bream are found primarily amongst seagrass beds which provide ideal habitat conditions including the availability of small invertebrate prey and adequate shelter (Kailola et al 1993; Cashmore et al 2000). Spawning usually occurs from August to January in any given year; however, it may begin later in more westerly estuaries (Cadwallader & Backhouse 1983). Female black bream first spawn at approximately 24 cm in total length and can release between 300,000 and 3 million eggs (per event) depending on environmental conditions. Males become sexually mature at 22 cm (Kailola et al 1993). The survival of black bream larvae appears to be heavily dependent on suitable salinity and water temperature conditions as well as food and habitat availability (Kailola et al 1993; Cashmore et al 2000). Estuary perch are resident in estuaries along the coast of Victoria (Williams 1970). Estuary perch occur in tidal estuaries, rivers and sometimes also in freshwater lakes (Allen 1989). Adults migrate into areas of high salinity where spawning occurs in response to rising temperatures. This occurs in November or December in Victoria when water temperatures reach 14 - 16 °C (Allen 1989). Spawning may also be triggered by the freshwater flush that occurs after the spring rains in September to November (N Marine 2000, pers. comm.). In some cases they have been reported to migrate into freshwater sections of the Hopkins River (L Gunthorpe 2000, pers. comm.). Estuary perch spawn in areas with submerged aquatic plant beds in brackish water adjacent to deep banks. Eggs and larvae remain in the water column for 2 to 3 days prior to hatching. Juvenile perch remain in areas of high salinity before moving into lower salinity areas as they grow older (Koehn & O'Connor 1990) and may congregate in schools until they reach 7 cm in length. Larger fish do not appear to display schooling behaviour. Mulloway are found in waters from Bundaberg in Queensland, around southern Australia to North West Shank in Western Australia. They are a coastal fish and can be found in a variety of habitats including the lower reaches of rivers, estuaries, bays, inlets, along ocean beaches and in open waters to a depth of 150 m (Kailola et al 1993). While mulloway are common in western Victorian waters, they are much less abundant east of Melbourne (Kailola et al 1993). The species is highly prized by recreational anglers. Mulloway can live for 30 years and reach sexual maturity at 6 years when they are 75 cm long (Kailola et al 1993). Mulloway spawn in the surf zones close to ocean beaches from late spring to summer (Kailola et al 1993). Nothing is known of the larval life-stage though it is thought larvae remain in open coastal waters for several months (Kailola et al 1993). Small juveniles enter estuaries/rivers when they are 5 to 10 cm in length. Juveniles are thought to have wide salinity tolerances. One to 2 year old juveniles are most common in New South Wales estuaries from February to September while young adults can be found in embayments and estuaries from September to October (Kailola et al 1993). Mulloway feed on a variety of fish including yellow-eye mullet, garfish and juvenile mulloway, crabs, prawns and worms (Kailola et al 1993). This is a highly mobile species and tagging studies conducted in New South Wales indicate individual fish can travel hundreds of kilometres between estuaries. Mulloway appear to occur in the estuarine reaches of the Glenelg River throughout the year. Sizes generally range from 30 cm to 90 cm in length. Smaller mulloway have been observed in the Crawford River, a tributary of the Glenelg River. Mulloway are also found in the Yambuk Lake, Moyne River and Hopkins River estuaries (Appendix 4). Yellow-eye mullet inhabit bays, estuaries and open coastal waters of Victoria's coastline, where they school and form aggregations over sand and mud substrates (Kailola et al 1993). Yellow-eye mullet have broad salinity and temperature tolerances and have been reported in both brackish and open ocean waters. Yellow-eye mullet can reach up to 40 cm in length (Hall 1984) and mature at about 2 to 3 years of age (Harris 1968). Mature fish form large aggregations in coastal waters and marine embayments prior to spawning (cited in Gunthorpe & Hamer 2000). In Victorian waters, spawning may occur from late spring until autumn (Ramm 1986; Rigby 1984). The spawning locations and details of the larval life of yellow-eye mullet in Victorian waters are not well understood, but spawning is suggested to occur predominantly in coastal waters outside bays and inlets (Chubb et al 1981; Jenkins et al 1996). When they attain a size of 30 to 40 mm in length, juvenile yellow-eye mullet move into Victorian bays and estuaries from late summer through to early spring (Ramm 1986; Jenkins et al 1993; Jenkins et al 1996; Robertson 1978). Juveniles are abundant in shallow water over seagrass and unvegetated sand habitats, but are less common over shallow reefs (Jenkins et al 1993; Jenkins et al 1996). Yellow-eye mullet are omnivores, with broad dietary requirements. Young juveniles feed mainly on zooplankton. Older juveniles and adults feed on detritus, plankton, filamentous algae, polychaetes (marine worms) and other small invertebrates (Thompson 1957; Rigby 1984). However, algae may dominate the diet of larger fish (Edgar et al 1993). Yellow-eye mullet are commonly found in the Moyne River, Merri River and Hopkins River estuaries. It is likely that adult yellow-eye mullet feed just outside of the river mouth and move in and out of the river. All of the other western inlets have river mouths that close over periodically, which consequently restricts the entry and egress of shoals of mullet. Glenelg spiny crayfish belong to the genus Eustacus, of which there are ten known species that occur in Victoria (DSE 2005). Eustacus bisponosis is characterised by heavy claws and a spiny appearance, with distinctive thoracic spines and abdominal spines. Glenelg spiny crayfish are usually found in flowing streams with riparian vegetation within the Glenelg River and its tributaries. Their range is known to extend up to 320 m above sea level into the Grampians in the northern parts of the Glenelg River Basin (DSE 2005). Glenelg spiny crayfish can take around 8-11 years to reach maturity (Honan and Mitchell 1995). Females breed once per year and have few large eggs (63-112) that are carried under the tail for up to seven months, hatching in October to December (Honan & Mitchell 1995). Glenelg spiny crayfish are listed as Threatened under the Flora and Fauna Guarantee Act 1988 (FFG Act) because of their restricted distribution, decline in range, lack of knowledge of their population numbers, slow growing life history and low annual reproductive capacity. The species is also considered vulnerable to habitat threats including clearing of riparian vegetation, agriculture, and impacts of overfishing, as identified in the Department of Sustainability and Environment's Action Statement for Glenelg spiny crayfish (DSE 2005). Short-finned eels are widespread from southern Queensland to South Australia (Cadwallader & Backhouse 1983). They are found in a range of habitats including upper reaches of rivers, estuaries, lakes and swamps in the region. Mature short-finned eels migrate from freshwater to estuaries in late spring and early summer, before migrating out of estuaries into ocean waters during late summer and early autumn (Koehn & O'Connor, 1990). Spawning is thought to occur in the Coral Sea off the north east of the Queensland coast. Adults are thought to die after spawning. The leptocephali (larvae) and glass eels (small juveniles) drift south on the east Australian current and may spend 1 to 3 years in ocean waters before the glass eels move into estuaries at about 50-70 mm in length. The annual migration of glass eels into Victorian estuaries occurs from May in the east of the state and continues until about October in the west (Koehn & O'Connor 1990). Eels in the brown elver stage (larger juveniles) migrate from estuaries into freshwater from about late spring and during summer. Migrations of brown elvers are triggered by reduced river flow and increasing water temperature. High river flows during this period could inhibit upstream migrations. Weirs and barriers can inhibit upstream migration or increase predation on the migrating elvers. Glass eels may be found over seagrass in estuaries and may seek shelter in mud or vegetation. Shortfinned eels are generally a still-water species preferring slow, silty stream habitats. Whilst the annual migration of brown elvers to freshwater occurs in spring/summer, they may spend several years in estuaries before undertaking this migration (Koehn & O'Connor 1990). Short-finned eels can take many years to reach maturity. Males may not leave freshwater for the sea until 8-12 years of age and females until 10-20 years of age (Koehn & O'Connor 1990). When inhabiting freshwater, eels are nocturnal. They are bottom feeders that rely heavily on their strong sense of smell to find food. Feeding may be more intense in spring and summer (Cadwallader & Backhouse 1983). They are predominantly carnivorous, feeding on a wide range of aquatic organisms, such as insects, crustaceans, worms, molluscs, fish (including other eels) and frogs. River blackfish are widely distributed throughout Victoria and are found above and below the Great Dividing Range (DPI 2003a). Across the Glenelg Hopkins Region the species is found in many rivers and tributaries. This species is distinct from the two-spined blackfish (Gadopsis bispinosis) that is typically found in north-eastern Victoria. The preferred habitat of the river blackfish includes cool, clear streams with a gravel, cobble or boulder substrate and abundant cover. Introduction of artificial habitats in the form of boulders and woody debris to otherwise sparse waterways has drastically increased the abundance of the species - confirming its preference for instream habitat and providing shelter where high water velocities is provided (Koehn 1987). Spawning occurs in spring and early summer. Eggs are laid in areas of low water velocity such as hollow logs and between boulders; artificial structures such as PVC pipes also provide successful spawning habitat (Koehn & 'Connor 1990). Non-indigenous target species are species that are not naturally present but provide important recreational fishing opportunities in the Glenelg Hopkins Region. Trout are a non-indigenous species that provide a major social and economic contributor for regional communities. While these species provide important social and economic benefits to regional communities, their management requires consideration of the adverse impact they may have on indigenous species. Wager and Jackson (1993) reported that trout species have had a major impact on indigenous fish species, being implicated in the decline of several species such as native galaxiid and pygmy perch, as well as in predation on juveniles of Australian grayling and Macquarie perch. Species like trout may not be able to complete all stages of their life cycle and may be limited in production due to unsuitable environmental conditions in the Glenelg Hopkins Region. Management of these species usually requires alternate management intervention through regular stocking regimes. Brown trout are native to the cool and cold waters of Europe, and were introduced to Australia in the 1860s as a recreational sport fish (McDowall 1996). Its distribution has increased through a combination of translocation and migration. The ideal habitats for this species are cool, welloxygenated waters, such as rivers and streams with moderate to fast flow. Brown trout are also supported by lakes and impoundments where suitable water quality, habitat and food exist. Brown trout can sometimes be found in marine systems such as the Moyne and Merri River estuaries. Spawning season extends from autumn into winter. Fish migrate upstream into smaller tributaries and feeder streams, or spawn locally in resident rivers. Trout require a gravel substrate for the deposition of eggs to ensure sufficient oxygen supply. Rainbow trout are native to the Pacific coast of North America. The species was introduced to Australia in the 1890s from New Zealand where it had previously been introduced from California. As was the case with brown trout, it was introduced to satisfy a sport fishing market (McDowall 1996). Rainbow trout are able to tolerate slightly higher water temperatures than brown trout. This species tends to be more successful in lakes than in rivers and streams. Generally, when brown trout and rainbow trout are together, brown trout tend to dominate. Spawning requirements for this species are similar to those of brown trout, although they spawn later in the year, during winter and early spring. Redfin, also known as English perch, was introduced from Europe during the 1860s (McDowall 1996). Redfin prefer lakes and still, slow flowing rivers with abundant aquatic vegetation. Vegetation plays an important role in the life cycle of redfin. During spawning the female disperses eggs amongst aquatic plants and submerged logs. Redfin are known to be susceptible to the lethal endemic virus, epizootic haematopoietic necrosis virus (EHNV), particularly during summer months. During an initial epidemic, high adult and juvenile mortality occurs. In endemic areas, most mortalities occur in juveniles. Infection is characterised by necrosis of the renal hematopoietic tissue, spleen, liver and pancreas. Redfin feed on a variety of aquatic species, including molluscs, crustaceans and small fish. Three bait licences presently operate in coastal and estuarine waters within the Glenelg Hopkins Region. These licences allow for the harvest of bait species using prescribed commercial fishing equipment. Apart from coastal marine waters, most recent effort has focussed on collection of sandworms, crabs, mullet and yabbies within the Hopkins and Glenelg estuaries. The eel fishery is managed through the Victorian Eel Fishery Management Plan (DNRE 2002a). The Victorian commercial eel fishery is an important fishery for the State, comprising two species: the short-finned eel, and long-finned eel. Overall, the short-finned eel makes up approximately 95% of total eel production. This is the only species of eel found in the Glenelg Hopkins Region. The wild short-finned eel component of the fishery is comprised largely of migrating adult eels. The reliance of the existing commercial eel fishery in Victoria on this component of the fishery is consequently very great, particularly during periods of drought when productivity from stockenhanced waters is low. There are currently four licence holders operating in the Glenelg Hopkins Region. The commercial fishery is input managed, with limited entry, gear restrictions and water allocation the main management controls. There is no Total Allowable Catch (TAC) set. Commercial harvesting of eels in the Glenelg Hopkins Region occurs in the Portland and Hopkins River Basins. The following specified waters are allocated to various licensed commercial fishers for that purpose: Eumerella River downstream of Princes Highway bridge, including Yambuk Lake; Lake Gillear; Merri River (including Kelly Swamp); downstream from the Woolaston Weir; Lake Learmonth; and Deep Lake. The Fitzroy, Moyne, Surry and Shaw Rivers, and Darlot Creek, all downstream from the respective bridges on the Princes Highway, and Belfast Lough are also commercially fished for eels. In addition to these waters, Eel Access Licence holders may fish in all Crown lakes, dams, swamps, marshes and morasses south of the Great Dividing Range, with a few specified exceptions. A small number of Wildlife Reserves are also commercially fished under additional general permits. Under an Aquaculture Licence, eel stocks may presently be enhanced, on-grown and harvested in the following waters of the Glenelg Hopkins Region: Lake Bolac, Fiery Creek, Lake Linlithgow, Lake Burrumbeet, Lake Oundell, Lake Buninjon and Lake Bullrush, as well as a number of private waters. Commercial eel fishing is not allowed in the Glenelg nor Hopkins rivers. The Fisheries Act 1995 (the Act) is administered by the Victorian Department of Primary Industries. Fishing activities in all Victorian public waters are managed under the provisions of the Act and the Fisheries Regulations 1998 (the Regulations). To provide for the management, development and use of Victoria's fisheries, aquaculture industries and associated aquatic biological resources in an efficient, effective and ecologically sustainable manner. To protect and conserve fisheries resources, habitats and ecosystems including the maintenance of aquatic ecological processes and genetic diversity. To promote sustainable commercial fishing and viable aquaculture industries and quality recreational fishing opportunities for the benefit of present and future generations. To facilitate access to fisheries resources for commercial, recreational, traditional and nonconsumptive uses. The Act provides for the development, implementation and review of fishery management plans; facilitates participation of stakeholders in fisheries management via fisheries co-management arrangements; and prescribes enforcement powers to assist in achieving compliance with fishing controls. It is important to note that the provisions of fisheries legislation can only be applied to the control of fishing activities. Other human activities (e.g. catchment land use, foreshore management, competing water-based recreational activities) that may directly or indirectly affect fish habitats, fishery resources or the quality of fishing, are managed by different agencies under a variety of legislation. The Flora and Fauna Guarantee Act 1988 (FFG Act) is administered by the Victorian Department of Sustainability and Environment (DSE). The FFG Act provides an administrative structure to enable and promote the conservation of Victoria's native flora and fauna and to provide for a choice of procedures which can be used for the conservation, management or control of flora and fauna and the management of potentially threatening processes. The FFG Act provides for the listing of species, communities or threatening processes. Following the listing of a species, Action Statements are prepared that provide background information about the species, including its description, distribution, habitat, life history, the reasons for its decline and the threats which affect it. They also state what has been done to conserve the species and what will be done in the future. Action Statements are designed to apply for three to five years, after which time they are reviewed and updated (www.depi.vic.gov.au). Within the Glenelg Hopkins Region the following fish species have been listed as Threatened under the FFG Act: Australian grayling (Prototroctes maraena), dwarf galaxias (Galaxiella pusilla), Yarra pygmy perch (Nannoperca obscura), variegated pygmy perch (Nannoperca variegata), Western swamp crayfish (Gramastacus insolitues), Glenelg spiny crayfish (Eustacus bispinosus) and Macquarie perch (Macquaria australasica). An Action Statement has been prepared for Glenelg spiny crayfish. Draft Recovery Plans and Action Statements are being prepared for the other five species. Species that are listed under the FFG Act can only be harvested by recreational fishers if a Governor in Council Order has been issued. A Governor in Council Order exists for the harvest of Glenelg spiny crayfish within the Glenelg Hopkins Region. The Heritage Rivers Act 1992 and the National Parks Act 1975, administered by the DSE, also provides guidance in relation to the protection of native biodiversity in considering translocations in inland waters. In summary, the introduction of nonindigenous fauna is not permitted in natural catchment areas, as defined in the Heritage Rivers Act, National Parks, State Parks and Wilderness Parks as defined in the National Parks Act and reference areas as stated in provisions under the Reference Areas Act 1978. The estuarine reach of the Glenelg River is listed as a Heritage River. The Environment Protection and Biodiversity Conservation Act 1999 (EPBC Act) is administered by the Commonwealth Department of Environment and Heritage. The EPBC Act provides for the identification of key threatening processes and the protection of critical habitat. The Act also promotes the conservation of biodiversity and provides for the protection of listed species, protected areas and communities in Commonwealth areas. Within the Glenelg Hopkins Region the following freshwater fish species have been listed as vulnerable under the EPBC Act: dwarf galaxias, Yarra pygmy perch, variegated pygmy perch and Australian grayling. There is an expectation in Australia and worldwide that utilisation of fish resources will be managed according to these ESD principles. These principles have been recognised in the GHFMP. Co-management is a participatory arrangement that brings industry, community and government together to participate in the management of a natural resource. It assists those involved by improving their collective understanding of individual stakeholder needs and aspirations and by identifying behavioural modifications that can increase the long term viability of the resource and, therefore, continued access to that resource by user groups. The co-management of fisheries within Victoria is a process involving three entities. The first comprises the peak bodies, including VRFish. The second entity comprises the Fisheries Co- Management Council (FCC) and its technical based committees. Finally, the third entity is the government agencies, including DPI of which Fisheries Victoria is a division. The above co-management entities will ensure that the fisheries interests are appropriately represented and considered during consultation processes regarding decisions that may impact on the fishery. Victoria is currently working with Indigenous community representatives, other Australian fisheries authorities and other fishing stakeholders to develop: a national set of principles and pathways to facilitate definition and lasting recognition of customary fishing practices; increased opportunities for economic engagement of Indigenous communities in fisheries-related enterprises; and increased Indigenous participation in all aspects of fisheries use and management. Indigenous support for such a framework will not affect the legal rights of Indigenous people nor limit their scope to pursue other options. However, it is considered that such a framework will be better able to deliver practical outcomes within the foreseeable future than litigation. Customary fishing practices by Indigenous Australians are not currently identified as a distinct type of fishing activity under Victorian fisheries legislation, and non-commercial fishing by Indigenous Australians is, therefore, treated as recreational fishing. The Kirrae Wirrung and Gundidjmara collectively known as Maar (the people) of southwest Victoria, with the support of the Australian Government Department of Environment and Heritage, have jointly prepared the Kooyang Sea Country Plan (KSCP) which was released in April 2005 (Kooyang means eel). The KSCP was developed in recognition of the need for Indigenous people's rights in participating in determining the future sustainable uses of aquatic systems and fisheries. A major objective of the KSCP is to build and strengthen partnerships with recreational fishing organisations and government departments and agencies that share interests and responsibilities for the sustainable use of our fisheries and the environmental health of our waterways and wetlands. The KSCP describes the ongoing and intimate relationship of Indigenous people with river and wetland environments stretching back over thousands of years. This ongoing relationship is reflected in the cultural sites that are associated with the Glenelg Hopkins waterways, catchments and lakes. The KSCP details how this relationship is based on a long tradition of stewardship, utilisation and cultural significance. For Indigenous people, their cultural values are intertwined around traditional uses, spiritual connection, ancestral ties and respect for the rivers and lakes and the resources that they provide. The KSCP is a vehicle for increasing community and government awareness of Indigenous values and cultural connections with "country" and is a tool for negotiating greater Aboriginal involvement in the management of the waterways and wetlands of the study area. The release or stocking of fish into inland waters has long been used as a fisheries management tool, to create or enhance a recreational fishery. Fish are routinely released throughout Victoria every year for this purpose. DPI holds annual consultative meetings in February each year as a forum for discussing fish stocking, fish population surveys and other related recreational fisheries management issues. Meetings involve representatives from Fisheries Victoria, DPI, DSE, Primary Industries Research Victoria (PIRVic), Water Management Authorities, Catchment Management Authorities, VRFish and other stakeholders. identify current fishery management issues. Appendix 5 provides a list of fish stockings for the past six years (2000-2005) for the Glenelg Hopkins Region. Appendix 5 provides a list of fish stockings for the past six years (2000-2005) for the Glenelg Hopkins Region. Translocation of live aquatic organisms poses an ecological risk through the potential transmission of diseases, potential impacts on biodiversity from changes in genetic integrity and direct competition, and the establishment of feral and or exotic populations (DPI 2003). The Victorian Government has developed Guidelines for Assessing Translocations of Live Aquatic Organisms in Victoria 2003 (DPI 2003) to meet its obligations under the National Policy for the Translocation of Live Aquatic Organisms 1999 (MCFFA 1999). This Commonwealth policy requires all states in Australia to develop assessment measures for the translocation of aquatic organisms, including fish. Stocking proposals will be conducted in accordance with the Guidelines for Assessing Translocations of Live Aquatic Organisms in Victoria (Translocation Guidelines) and any associated protocols approved by the Secretary, DPI. To ensure that existing fish stocking programs and new proposals which have manageable risks can proceed without the need for individual risk assessments, protocols for public water stockings have now been developed. The Protocols for the Translocation of Fish in Victorian Inland Public Waters (Protocols) will ensure consistency with the Translocation Guidelines. Importantly, fish stocking proposals that meet the criteria outlined in the new protocols will not require an individual risk assessment. More information on the Translocation Guidelines and associated Protocols can be obtained from the DPI website: www.depi.vic.gov.au/fishing-and-hunting. A Recreational Fishing Licence is required for all forms of recreational fishing in Victorian public waters. Some sectors of the community, including people under 18 or over 70 years of age, holders of a Victorian Seniors Card, and recipients of various age, disability or veterans benefits, are exempt from the need to hold a licence. The Regulations define "recreational fishing equipment" as including a rod and line, handline, dip/landing net, bait trap, spear gun, hand-held spear, bait pump, recreational bait net and recreational hoop net. Recreational use of any equipment not included in this definition is prohibited in all Victorian public waters. The maximum numbers and permitted dimensions of dip nets, bait traps, bait pumps, recreational bait nets and recreational hoop nets are prescribed in the Regulations and summarised in the Victorian Recreational Fishing Guide. All lakes, impoundments, rivers, creeks and estuaries of the Glenelg Hopkins Region are classified as "inland waters" for the purposes of the Regulations. Restrictions on the use or possession of recreational fishing equipment in Victorian inland waters are prescribed in the Regulations and summarised in the Victorian Recreational Fishing Guide. Most notably, anglers are currently restricted to using no more than two lines per person in inland waters. Legal minimum sizes, bag limits, possession limits (in, on or next to fishing waters) and boat/vehicle limits for fin fish and invertebrate species are prescribed in the Regulations and summarised in the Victorian Recreational Fishing Guide. Further limits may be introduced by a Fisheries Notice when a resource threat is recognised. Some size and catch limits have been introduced as measures to protect fish stocks from heavy fishing pressure. However, many of these limits have been adopted on ethical or cultural grounds, such as the definition of a reasonable day's take for personal use. For some fish species with high commercial market value, there is a requirement to retain captured fish in whole or carcass form until after they have been landed (brought ashore) in order to ensure compliance with recreational size and catch limits. Fish species required to be landed in whole or carcass form include all shark species, elephant fish, King George whiting, bream, snapper and eels. In the case of sharks and elephant fish, "carcass" means a fish which has been gutted and headed forward of the first gill slit, but has not been skinned or filleted. In the case of scale fish, "carcass" means a fish which has been scaled and gutted, but has not been headed or filleted. The GHCMA is the lead agency responsible for management of the Region's land and water resources. The Glenelg Hopkins Regional Catchment Strategy 2003-2007 (RCS) is the primary planning framework for land, water and biodiversity in the region and is an overarching strategic document under which are nested various action plans and strategies (GHCMA 2003). The RCS provides strategic direction for the development of a Regional River Health Strategy (RRHS), Regional Drainage Strategy, Nutrient Management Plan, Salinity Plan, Weed and Rabbit Action Plans and Native Vegetation Plans. The RRHS describes the principles and priorities that will be used in river management across the Glenelg Hopkins Region. The RRHS identifies assets, threats and priority actions across the region's 32 sub-catchments. The RRHS identifies recreational fishing as a social value and asset. Many of the actions described in the RRHS will have positive outcomes for recreational fishing. there is no further decline in abundance or distribution, and by 2008 there is an increase in the abundance and distribution, of species with local conservation significance (river blackfish, mountain galaxias, Glenelg freshwater mussel and western swamp cray) in the region (T43 - Aquatic species). GHCMA is currently developing a Monitoring, Evaluation and Reporting Strategy that will provide the framework for monitoring and reporting achievements in reaching these targets. The GHFMP's strategies and actions broadly support these resource condition targets. The South West Coastal Action Plan (2002) was prepared by the Western Coastal Board and is a key mechanism for implementing the Victorian Coastal Strategy at a regional scale. The Action Plan provides for the development of the South West Estuaries Coastal Action Plan (SWECAP). The SWECAP (2002) provides a strategic framework for the development of individual estuary management plans. The SWECAP recommends the development of estuary management plans for the Glenelg River, Surry River, Fitzroy River, Yambuk Lake, Moyne River, Merri River and Hopkins River. Within the Glenelg Hopkins Region, the Yambuk Lake Estuary Management Plan and Hopkins Estuary Management Plan have been completed. Plans will also be developed for the remaining estuaries in the coming years. Estuary management plans provide a basis for coordinated protection and enhancement of the environmental values of the area while also considering the social and economic values that are of great importance to the local and wider community (GHCMA 2004a). Estuary management plans will recognise the importance of both commercial and recreational fishing activities and the links between productivity of fisheries resources and other factors, including water quality and artificial openings. promote the cost efficient use of public resources in carp eradication and control programs. At a state level, the Victorian Pest Management - A Framework for Action (VPMF) (DNRE 2002) sets out the guiding principles of how pests will be managed in Victoria. The VPMF provides a mechanism for considering terrestrial and aquatic (freshwater and marine) weed, and vertebrate and invertebrate pest management in Victoria. Currently, there is no specific species strategy for the management of carp in Victoria. There is scope for other declared aquatic species to be considered by the VPMF. The GHCMA and Glenelg River Technical Group has led the preparation of a Glenelg River Carp Management Plan (GRCMP) that describes how carp will be managed in the Glenelg River Basin. The GRCMP outlines actions for carp management from 2003 to 2005. The GRCMP will be reviewed in 2006. The movement, regulation and delivery of water resources from rivers, lakes and groundwater supplies are overseen by a number of agencies within the Glenelg Hopkins Region. Grampians Wimmera Mallee Water (GWM Water) provides urban, rural stock, domestic, and irrigation water supplies primarily to the Wimmera and southern Mallee districts. It also provides urban water to a number of towns of varying sizes in the Glenelg Hopkins catchment. A large proportion of the water for the channel system is sourced from the Glenelg River, with both Rocklands and Moora Moora Reservoirs being located within the upper Glenelg. Rocklands Reservoir represents 47% of the total storage capacity of the system. GWM Water is responsible for supplying the environmental flows into the Glenelg River as in accordance with the operating plans provided by GHCMA. The volume of water is prescribed under the Wimmera-Glenelg Bulk Entitlement orders. Currently, GWM Water authority is in the process of replacing its open channels with a reticulated pipeline network. As a result of these works, the water available to the environment (both Glenelg and Wimmera Rivers) will progressively increase as sections are completed. Wannon Region Water Authorities (Wannon Water) supplies domestic water and wastewater services for much of the Glenelg Hopkins Region. The Authority was formed through the merges of three existing water authorities: Glenelg Region Water Authority, Portland Coast Water and South West Water. Wannon Water manages a number of water storages, including Konongwootong Reservoir, which will be decommissioned in the next couple of years (page 29). Southern Rural Water (SRW) manages rural water resources for the southern half of country Victoria, from the Great Divide to the coast. SRW is one of five rural water authorities in Victoria that provide services to farmers, graziers and growers through the management and control of irrigation water from rivers and groundwater aquifers. For regulated streams such as the Glenelg River, environmental flows are considered in bulk entitlement guidelines. For unregulated streams, environmental flows can be considered through the development of streamflow management plans. Within the Glenelg Hopkins Region, a streamflow management plan has been developed for the Merri River (SRW 1998). The purpose of the streamflow management plan is to ensure the long-term sustainability of the river through the implementation of a framework of rules that aim to clarify the rights of water diverters and ensure future development does not interfere with existing water users and occurs in an ecologically sustainable manner. Across the Glenelg Hopkins Region there are eight local government bodies: Glenelg Shire Council, Moyne Shire Council, Warrnambool City Council, Ararat Rural City Council, Southern Grampians Shire Council, City of Ballarat, Pyrenees Shire Council and a small area administered by the Corangamite Shire Council. Local government manages a range of issues that can impact fisheries resources and recreational fishing opportunities. Applications for planning permits, review of planning overlays and zones, and the maintenance of roads and tracks can all have an impact on angler access to fisheries resources, and the habitats that support these resources. Local government also has an important role in implementing environmental programs (for example weed management) and engaging community groups in natural resource management projects. The GHFMP was prepared by Fisheries Victoria, assisted by a steering committee comprising key stakeholders including the VRFish, FCC, GHCMA, Indigenous interests, DSE, GWM Water and DPI. The role of the steering committee was to advise the Executive Director, Fisheries Victoria, with respect to the conformance of the management plan with the requirements of the Act and the Ministerial guidelines, and to respond to community consultation on the draft GHFMP. A list of the steering committee members is provided in Appendix 1.
declaration of the management plan in the Victorian Government Gazette. The first step in the development of the GHFMP was to seek the views of recreational fishers, and other community interests, regarding values and issues associated with fishing in the lakes, rivers and estuaries of the Glenelg Hopkins Region. opportunities to enhance recreational fishing across the inland Glenelg Hopkins region. A total of 60 people attended the three public meetings. Participants included representatives from angling clubs, non-club members who actively fish, Fishcare representatives and other members of the public with a general interest in local resource management issues. Over 100 verbal and written submissions were also received. This information helped to guide the drafting of the GHFMP so that it had a strong focus on addressing fishing-related issues that matter to recreational fishers and the local community. The estuarine environments of the Region were considered to be of highest value in terms of recreational fishing opportunities. The most popular estuarine angling species was black bream, followed by mulloway, estuary perch and yellow-eye mullet. The most popular freshwater angling species were brown trout, rainbow trout, redfin and short©\finned eels. There was concern regarding carp populations in the Glenelg River and Rocklands Reservoir and the impact this would have on these fisheries. Access to waterways in some parts of the region is limited by private property, poor condition of tracks, and a general lack of information regarding the status of land and its ability to be legally accessed by the general public. Boat ramp facilities at some locations are limiting the ability of anglers to gain access to waterways. population growth and urbanisation increasing fishing effort in the estuaries, particularly the Hopkins River estuary. Water flows and water quality is impacting the recreational fishing potential of most rivers and lakes in the region. While most anglers accept this is a result of low rainfall in recent years, they indicated that water diversions from the upper Wannon and Glenelg systems are having an impact on these rivers and suggested arrangements should be reviewed. Concern over the impact of saline water and sand slugs in the Glenelg and Hopkins systems. The overall purpose of the GHFMP is to formalise management arrangements for the Glenelg Hopkins Region in accordance with the provisions of the Act, the Ministerial guidelines and the national Fisheries ESD Reporting Framework (Fletcher et al 2002). To this end the GHFMP specifies goals, objectives, strategies and actions for management of fisheries resources across the Glenelg Hopkins Region. The GHFMP identifies the most valued recreational fishing assets in the Region and describes the highest priority strategies and actions to mitigate issues/risks that could impact on these fishing assets. The GHFMP also identifies recommended actions by stakeholders and other management agencies to ensure that processes for management of other values and uses of the Region's waterways includes identification and minimisation of potential adverse impacts on fish habitat and fisheries. The GHFMP contains a section describing research and monitoring information needed to address the identified management objectives and performance indicators; a section outlining compliance with fishing controls in the region; and a section describing implementation and future review processes. As gazetted on 30 June 2005, the GHFMP will provide management direction for fishing activities across the inland area administered by the GHCMA. This area includes all inland waterways (lakes, rivers and estuaries) in the Glenelg River Basin, Hopkins River Basin and Portland Coastal Basin. any other waters declared by the regulations to be inland waters. Regulation 107 of the Regulations describes all inland waters in Victoria as a fishery by virtue of using recreational fishing equipment. Recreational fishing equipment relevant to the waterways in the Glenelg Hopkins Fishery, includes a rod and line, handline, dip net, bait trap, landing net, and recreational hoop net. Up-to-date information on permitted recreational fishing equipment can be found in the Victorian Recreational Fishing Guide, which is released on an annual basis. The Glenelg Hopkins Fishery, for the purposes of this management plan, does not include commercial bait and eel fishing as these are managed through commercial licensing processes for bait, and additionally for commercial and recreational take of eels, through the Victorian Eel Fishery Management Plan. The Glenelg Hopkins Fishery is defined as all recreational fishing activities, with the exception of recreational harvest of eels, within the inland waters in the area administered by the GHCMA. The GHFMP will provide the basis for the management of the Glenelg Hopkins Fishery for a period of five years. Should there be a need for the Minister to amend the management plan prior to its review, notice of this intention will be published in the Victorian Government Gazette and there will be formal consultation with stakeholder groups. Review of the GHFMP and preparation of a new GHFMP will commence 12 months prior to the scheduled expiry of the GHFMP. The review will examine all aspects of fisheries management against the defined goals, performance indicators and targets, and will examine the need for new or amended objectives as a result of monitoring and research information obtained. Should there be a need for the Minister to amend the GHFMP prior to this review, notice of this intention will be published in the Government Gazette. as far as relevant and practicable, identify: any other biological, ecological, social and economic factors relevant to the fishery covered by the management plan, including its current status, human uses and economic value; measures to minimise its impact on non©\target species and the environment; research needs and priorities; the resources required to implement the management plan. Additional direction on the development of the GHFMP has been provided by the gazettal of Ministerial guidelines on 30 June 2005 (see Appendix 6). Biological - To conserve and ensure sustainable use of key fish stocks across the Glenelg Hopkins Fishery. Social - To maintain and where possible enhance recreational fishing opportunities across the Glenelg Hopkins Fishery. Environmental - To promote protection of the habitats and environments which are essential for production or maintenance of fisheries resources across the Glenelg Hopkins Fishery. Governance - To achieve maximum community participation, understanding and support for the management of fisheries resources across the Glenelg Hopkins Fishery. More detailed accounts of the strategies, management actions, performance indicators, targets and information needed to address each of these objectives are provided in the following sections and are summarised in Table 1. Performance indicators are provided for actions that Fisheries Victoria has responsibility for implementing. These indicators provide a means of tracking progress on an ongoing basis. As part of the annual reporting against the GHFMP, performance indicators may be further refined using data from monitoring programs and surveys. Targets provide a longer-term measure for the Objectives of the GHFMP. Targets should be achieved through the successful implementation of the GHFMP. An objective of the GHFMP is to ensure the sustainable use of fisheries resources. Managing the sustainable use of key target species requires a basic understanding of the likely stock structures of key fish populations, the fishing pressure being exerted on them, and an understanding of broader environmental impacts on production. This information can then assist resource managers in making decisions on management controls used to actively regulate the sustainable use of recreational target species. There has been only limited ongoing fisheries data collection in the rivers, lakes and estuarine environments of the Glenelg Hopkins Fishery. There has been a single angler diarist for black bream in the Hopkins River estuary since 1998, and in the Glenelg River estuary between 1998 and 2000. There has also been a small number of individual netting and creel surveys. However, there hasn't been a concerted effort to undertake ongoing monitoring to collect information that can demonstrate the sustainable harvest of key recreational target species. As there has been limited monitoring of key fish stocks within the Glenelg Hopkins Fishery, the focus of the GHFMP will be to maintain current management arrangements while fishery monitoring programs are established. Black bream, estuary perch and mulloway are a high priority for the establishment of monitoring programs as successful recruitment of these species can be infrequent or relatively uncertain, which when coupled with higher fishing pressure (compared with other species in the estuary) puts them at greater risk of overfishing. Glenelg spiny crayfish is also a high priority for the establishment of monitoring programs as this species has a limited geographic distribution, has been greatly impacted by habitat alteration and degradation and, in the past, has been affected by high levels of fishing pressure. These threats are recognised in the species listing as threatened under the FFG Act. Strategies and actions to monitor river blackfish are not described in the GHFMP, as the species is well distributed across Victoria's rivers and lakes and fishing pressure is generally low. The greatest threats to river blackfish are likely to be siltation of streams and removal of habitat (DPI 2003). River blackfish will continue to be managed at a statewide level. Strategies and actions to monitor the sustainable harvest of redfin are not described in the GHFMP as the species breeds regularly, is widespread throughout Victoria, readily colonises new waterways, and is unlikely to experience overfishing. Redfin will continue to be managed at a state-wide level. The management of brown trout and rainbow trout is discussed in the Recreational Fishing Opportunities section of the GHFMP. The key recreational target species from estuaries that require fishery monitoring are black bream, mulloway and estuary perch. The most effective fishery monitoring of recreational target species is through a research angler diary program. Information collected from the research angler diary program over a number of years can provide fishery managers with scientifically valid information on catch and effort rates of the target species. This information can be used as a basis for reviewing the appropriateness of current fishing regulations. This ongoing program will rely on experienced and highly skilled volunteer anglers undertaking research angling trips targeting specific fish species in accordance with prescribed methods. Hook size, bait and fishing location are varied within the identified estuaries to ensure a representative sample of the stock of a targeted species in the waterway is sampled. The program. Fisheries Victoria to seek funding to recruit research angler diarists for black bream and estuary perch in the Hopkins River and Glenelg River estuaries, and mulloway in the Glenelg River estuary. Bag and size limits are reviewed in accordance with information that is collected as part of the research angler diary program. The recreational harvest of key recreational estuarine species is sustainably managed in response to information collected from monitoring programs. While the Glenelg and Hopkins estuaries have been identified as priorities for ongoing monitoring in this management plan, in time, other estuaries may experience increased fishing pressure (above current levels), which may warrant a review of the extent of current monitoring arrangements. For example, if angler visitor numbers were shown to increase over a number of years in Lake Yambuk, there may be justification to expand the research angler diary program to include this estuary. To understand changes in fishing pressure, an ongoing monitoring program is required that collects data on angler visitor numbers at each estuary. This data will provide a coarse measure of changes in angling pressure within an estuary over time and will be used to determine priorities for potential additions to research angler diary programs. There are a number of techniques that could be employed to monitor angler visitor numbers including counts of anglers fishing from a specified location in an estuary or counting the number of boat trailers within a carpark adjacent to a launching ramp at an estuary. The type of data and its collection is likely to differ for each estuary; therefore, the details of the monitoring program will be determined on an estuary by estuary basis with input from regionally based Fisheries Victoria staff in consultation with VRFish. The following estuaries will be included in the monitoring program: Glenelg River, Surry River, Fitzroy River, Yambuk Lake, Moyne River, Merri River and Hopkins River. Fisheries Victoria to develop an ongoing monitoring program that will collect information on angler visitor numbers over time, in estuaries of the Glenelg Hopkins Fishery. Data is systematically collected on visitor numbers for all estuaries and is reviewed annually. Fisheries monitoring programs and control measures are adjusted in response to angling pressure. The Glenelg spiny crayfish is an endemic species to the Glenelg River Basin. It is vulnerable to environmental and fishing pressure due to its limited geographic range, slow growth rate, long life span and low fecundity with annual breeding (Horwitz 1990; Honan 1998; Honan & Mitchell 1995a, 1995b, 1995c). The Glenelg spiny crayfish is listed as Threatened under the FFG Act and allowable take as a recreational fishing species is provided through a Governor in Council Order that is administered by the DSE. At the time of publishing, the daily bag/possession limit was 1 (male only) with a minimum legal size of 10 cm. Up-to-date information on current regulations can be found in the Victorian Recreational Fishing Guide. Currently, there is no monitoring of the recreational harvest of this species, or its total population abundance. Information on the harvest and a population model are needed to improve understanding of the stock status and the sustainability of current fishing controls. undertake periodic monitoring to refine and validate the population model. Fisheries Victoria, in partnership with the GHCMA and DSE, to seek funding to establish a monitoring program, to inform development of a population model, to assess the sustainability of the current recreational harvest of Glenelg spiny crayfish. Recommendations made on the appropriateness of current bag and size limits in accordance with information that is collected from the Glenelg spiny crayfish monitoring program. Bag and size limits are adjusted to manage the sustainable harvest of Glenelg spiny crayfish. Within the Glenelg Hopkins Fishery, the maintenance of fishing opportunities for indigenous species is being addressed by managing the sustainable use of key target species (Sustainable Use of Fish Resources, page 21) and maintaining access to the resource (Issues affecting Recreational Fishing, page 28). Of equal importance, is the maintenance of stockenhanced non-indigenous salmonid (brown trout and rainbow trout) fisheries. Stocking programs are important to maintain the fishery as the habitat requirements for ongoing production (spawning and recruitment) are not usually sufficient to sustain populations in the Glenelg Hopkins Fishery. Brown trout and rainbow trout are stocked into a number of lakes and rivers within the Glenelg Hopkins Fishery as determined at annual consultation meetings (Regional recreational fisheries consultation meetings for fish stocking proposals, page 13). As discussed in Translocation Guidelines (page 14) the stocking of fish into public waters must be consistent with Guidelines for Assessing Translocations of Live Aquatic Organisms in Victoria (DPI 2003). Fisheries Victoria to continue to stock fish in support of recreational fishing in suitable waters as agreed at annual South West Regional Recreational Fisheries Consultation meetings. Stocking programs managed consistent with Guidelines for Assessing Translocations of Live Aquatic Organisms in Victoria and Protocols for the Translocation of Fish in Victorian Inland Public Waters, and outcomes of South West Regional Recreational Fishing Consultation meetings. Existing brown trout and rainbow trout fisheries are maintained subject to environmental constraints. There is increasing evidence worldwide that the sustainable use of any fishery resource is dependent not only on controlling the impacts of fishing on fish stocks, but also on maintaining the integrity of the aquatic habitats and the ecological processes they support that are crucial for the production and/or survival of target fish species. Inshore marine, estuarine and inland waters are facing increasing pressures from human population growth and associated agricultural, industrial, urban and tourism development. the spread of carp, particularly into estuarine environments. Artificial openings of river mouths must be managed in a way that maintains the ecological integrity of the system while still recognising the economic costs that flooding can have on infrastructure and agricultural land. Unauthorised openings may result in fish deaths, which may take many years to recover in terms of abundance and diversity of aquatic species. In response to past unlicensed openings and the need for clear and consistent guidelines, an Estuary Entrance Management Decision Framework is being developed. This initiative is being supported by Deakin University, Western Coastal Board, Environment Protection Authority, Corangamite and Glenelg Hopkins Catchment Management Authorities, Parks Victoria, DSE and the Victorian Coastal Council. The purpose of this framework is to ensure that decisions are balanced and transparent, considering environmental, social, cultural and economic issues. Poor water quality, including increased sedimentation and turbidity primarily resulting from catchment related processes such as land clearing, can have a significant impact on fisheries resources, particularly at the terminal estuarine reach of a river. For example, land clearing and removal of riparian vegetation can lead to increased erosion of nutrient-laden sediments. These sediments can reach waterways increasing nutrient levels that may result in algal blooms. The Yambuk Lake Estuary and Wetlands Management Plan (2004a) identifies water quality (pH, nutrients, turbidity and dissolved oxygen) as a significant issue that can affect production and health of fish stocks. The primary policy driver for improving water quality within the Glenelg Hopkins Fishery is the Regional River Health Strategy (GHCMA 2004). Sedimentation is addressed in the GHCMA's Sand Management Program (GHCMA 2006). The amount and timing of water moving down rivers and into estuaries can have a major impact on the production of river and estuarine fish species. In addition to natural variation, water flows have changed as a result of extraction and diversions for irrigation and domestic water supply needs. High river flows are important in the flooding of estuarine environments, as this process sustains important fringing wetland communities and associated food chains. The build up of water in the estuary can also lead to a more substantive breach of the estuary entrance resulting in a greater flush of any anoxic water that might be in the system as a result of stratification (see description of salt wedge estuaries page 5). This process of large water inflows and the salt wedge reforming is known to be a vital component for reproductive success of black bream in the Hopkins River estuary (GHCMA 2004). Water flows are managed in streamflow management plans, the Bulk Water Entitlement process, or through individual extraction licences. The upper Glenelg River (including Rocklands Reservoir) and certain waterways of the Hopkins River Basin are known to contain populations of carp. The RRHS recognises the potential threat of carp moving to high value estuarine reaches. The GHFMP also identifies carp as a threat to estuarine fish species that are also considered high value in terms of the recreational fishing opportunities they provide. The GHCMA has taken a lead role in managing carp within the region and has installed temporary screens at the outlets of Rocklands Reservoir to minimise the incidence of carp escaping into the Glenelg River. High-performance, permanent screens are scheduled for completion by mid-2006. The Glenelg River Carp Management Plan describes on-ground works that a number of agencies may implement to control carp in the Glenelg River. Anglers catching carp, particularly in the Glenelg Basin, are encouraged to report this catch by telephoning (03) 5571 2526. While the responsibility of implementing programs to improve habitat and environmental conditions of estuaries, rivers and tributaries primarily rests with the GHCMA, Fisheries Victoria can identify the key recreational target species and their biological requirements that may be placed at risk as a result of habitat degradation. This information can then be used by other resource management agencies to inform policies and programs aimed at addressing issues such as artificial river mouth openings, prioritising projects for improving water quality and determining appropriate river flows through Bulk Water Entitlement arrangements or development of streamflow management plans. The purpose of this strategy is to facilitate the collection of information on habitat and ecological conditions that affect the production of black bream, mulloway and estuary perch. The habitat and ecological requirements of fish species are best examined in terms of the key life stages that sustain their production: spawning, recruitment, survival, growth and movement. For estuarine species, much research has been completed within Victoria and other states of Australia on the impacts of habitat and ecological conditions on key life stages of black bream, mulloway and estuary perch. To date, this information has not been consolidated into a single form that can be used by resource managers. A literature review of existing research, and subsequent gap analysis of our understanding of habitat and environmental issues that affect production of the key estuarine species will prioritise further research or monitoring programs to be considered by the Glenelg Hopkins Fishery Reference Group (page 38). For Glenelg spiny crayfish, past projects have identified the habitat and ecological conditions required to sustain production, including the importance of riparian vegetation (Honan 2004). There is an opportunity to collect further information on in©\stream and riparian habitat during monitoring programs established as part of Strategy 1. These data will assist the GHCMA in identifying specific areas that require habitat protection and rehabilitation as a high priority. Fisheries Victoria to undertake a literature review and gap analysis of the habitat and environmental conditions required to sustain the production (spawning, recruitment, survival, growth and movement) of black bream, mulloway and estuary perch. Fisheries Victoria to develop monitoring and research priorities for consideration by the Glenelg Hopkins Fishery Reference Group. Fisheries Victoria, DSE and GHCMA to collect information on in-stream and riparian habitat data for Glenelg spiny crayfish during monitoring programs established in Strategy 1. Information collated on the production requirements of black bream, mulloway and estuary perch is provided to the GHCMA to inform reviews of the RRHS and Estuary Management Plans, and is used in the Estuary Entrance Management Decision Framework. Information gaps identified and reviewed, and priorities for further research are considered by the Glenelg Hopkins Fishery Reference Group. Information on the production needs of key recreational estuarine species is being used by the GHCMA in their policy development and investment programs. The management of carp in the Glenelg River Basin is managed through the Glenelg River Carp Management Plan (GRCMP) (Carp control, page 15). Fisheries Victoria's past commitment to the GRCMP has included monitoring the distribution and abundance of carp populations at different locations along the Glenelg River and in Rocklands Reservoir. The GRCMP will be reviewed in 2006 and Fisheries Victoria will work with the GHCMA, and other government agencies, in the review of these management arrangements and consideration of future management options. The GHCMA in their RRHS have identified the Hopkins River estuary as a High Social Value Reach and carp as a high risk to this value. This risk is based on the presence of carp in the upper Hopkins River Basin most notably in Lake Bolac, Lake Burrumbeet and anecdotal reports of small numbers in Mt Emu Creek. Options for addressing the risks of carp reaching the Hopkins River estuaries may be reviewed by the GHCMA. Fisheries Victoria to continue to assist in implementing the current Glenelg River Carp Management Plan as appropriate, and participate in its review in 2006, and to assist in the development of management options in the Hopkins Basin where key fisheries resources are considered at risk. Fisheries Victoria responsible actions implemented in the Glenelg River Carp Management Plan within agreed timeframes. Fisheries Victoria is engaged in the process to minimise risks of carp impacting key estuarine recreational fisheries. Public consultation during the management planning process has identified increasing angler access as the greatest opportunity for improving recreational fishing opportunities. VRFish in their access policy, VRFish Policy Paper - Access for Recreational Fishing (2004), describes access as "…the ease to which recreational fishers reach fishing waters or fisheries to conduct their recreation in accordance with the Fisheries Act and other laws, regulations and codes." VRFish, as peak body representing recreational fishing interests, is well placed to take a lead role in seeking improvements to recreational fishing access, particularly in light of recent policy reviews (VRFish 2004, 2004a). Other agencies, including Fisheries Victoria, may provide secondary assistance (eg facilitating discussions between government agencies) for actions or initiatives being led by VRFish for high priority projects that have multiple benefits for a range of user groups. Angler access issues that were identified during consultation can be described in four themes: facilities for boat-based fishing; land-based angler access; competition with other water-based recreational uses; and maintaining access to waterways following changed management arrangements. Responsibility for the provision and maintenance of boat launching facilities falls with different agencies depending on the waterway concerned. Responsible agencies within the Region include Parks Victoria, committees of management, water authorities and local government. The need for new or improved boat launching facilities has been raised in public forums for Rocklands Reservoir, Aringa Reservoir, Glenelg River estuary, Fitzroy River estuary and Yambuk Lake. It is possible that other locations, not identified during public consultation, may also need to be reviewed for adequacy of boat launching infrastructure. The proposal must have the support of the relevant management agency (land manager or water authority). The proposal must consider the impact of variations in water levels, particularly during times of drought. The proposal must link in with existing infrastructure such as roads. The proposal must be of benefit to other recreational boating groups. Funding for the provision of new or upgrade of existing boat launching facilities can be made through Marine Safety Victoria's Boating Safety and Facilities Program. Guidelines and principles for applicants are described in the yearly information package (MSV 2005). The Commonwealth Government's Recreational Fishing Community Grants Programme (DAFF 2005) may also be an appropriate source of funds for such applications. VRFish to liaise with anglers, land managers and water authorities to identify and submit applications for new, or upgrade of existing, boat launching facilities identified during the planning process. Land-based angler access is important and, in some cases, the only means of accessing some waterways within the Glenelg Hopkins Fishery. uncertainty regarding anglers' rights to gain access across land (Crown land, Crown land lease, or private land) that is adjacent to fisheries. Work to upgrade roads and tracks is prioritised by the relevant land managers and is based on available funding and the needs of the community. The most effective way to achieve improvements to roads and tracks is by engaging the relevant land managers and providing information on the most valued recreational fisheries to influence their prioritisation processes. Urbanisation around estuarine environments (eg Warrnambool and Hopkins River estuary) can reduce available access points for recreational anglers. Opportunities may exist for greater policy commitment from local governments to maintain angler access in future proposals for housing estates and other ventures that privatise land adjacent to fisheries resources. The development of Municipal Strategic Statements or other policies should recognise the value of recreational fishing and other leisure activities. Anglers also identified issues relating to a lack of knowledge regarding the legal status of land adjoining the waterway (Crown frontages, private land etc) and their right of access. The VRFish policy Access for Recreational Fishing (VRFish 2004) has reviewed this issue and made a number of recommendations, which, if implemented, will improve angler understanding of access issues across the state. A list of issues (including access) raised at public meetings is provided in Appendix 7. This list will assist VRFish in setting future priorities when engaging other agencies. VRFish to engage relevant land managers to promote road and track access for important recreational fishing locations within the Glenelg Hopkins Fishery. VRFish to engage local government to promote the maintenance of angler access through the development of policies that will recognise the importance of maintaining access to estuarine environments. VRFish to implement policy actions in its Access for Recreational Fishing to improve the understanding of their rights to access land adjoining recreational fisheries. There are many different recreational water-based activities that people undertake in the impoundments, lakes, rivers and estuaries of the Glenelg Hopkins Fishery. Generally, the different water-based users co-exist and follow regulations that have been established by the different management agencies to balance the needs of different user groups. During public consultation, some anglers raised concern regarding conflicts between anglers and personal water craft in the Glenelg River and Hopkins River estuaries. The different zones and speed limits in Victoria's waterways are specified in Marine Safety Victoria's Vessel Operating and Zoning Rules (MSV 2005), which are developed under the Marine Act 1988. The Rules identify Warrnambool City Council and Parks Victoria as the specified management authorities for the Hopkins River and Glenelg River estuaries respectively. These agencies are responsible for the day-to-day management of these waterways, including compliance and signage. Anglers can report any compliance breaches or issues relating to the management of the Hopkins River to the Warrnambool City Council (Ph: (03) 5559 4800) and for the Glenelg River the Parks Victoria office (Ph: 13 1963) at Nelson. Konongwootong Reservoir is a popular brown trout fishery located near the township of Coleraine. Wannon Water will decommission the reservoir in the next three to four years as alternate potable water is used to supply Coleraine. The decommissioning process will include extensive public consultation to ensure that interests of the community are considered in its future management. It is important that recreational fishing interests are considered in the future management of the reservoir. VRFish to actively represent the interests of local angling clubs during the decommissioning process to consider options for maintaining and enhancing recreational fishing values in the future management of the reservoir. Information derived from research and monitoring is an essential component of effective fisheries management. Targeted research projects and ongoing monitoring provide information on the status of key fish stocks, habitats and environmental conditions important for maintenance of key fish stocks, and evaluation of the effectiveness of new or altered fishery management measures. Research and monitoring programs will focus on two priority areas: the status of fisheries and fish stocks; and the environmental and habitat conditions for the maintenance of fisheries resources. As described in Strategy 1, the key recreational fish stocks that require monitoring are the estuarine species black bream, estuary perch and mulloway, and the Glenelg spiny crayfish found in the rivers and tributaries of the Glenelg River Basin. The aim of these monitoring programs is to collect information that can be used in future fisheries stock assessments that will guide decision-making on the appropriateness of current bag and size limits. For black bream, estuary perch and mulloway, information, including catch and effort trends, composition of fish stocks, levels of recruitment and key biological characteristics such as growth rates, will be collected through an ongoing angler research diary program in the Glenelg River and Hopkins River estuaries. This monitoring program relies on experienced volunteer anglers undertaking research angling trips targeting specific fish species in accordance with prescribed methods. The research angler diary program will be expanded to other estuaries of the Glenelg Hopkins Fishery if there is an increase in fishing pressure over time. Changes in fishing pressure will be assessed through an ongoing monitoring program that systematically monitors visitor numbers to the region's seven key estuaries: Glenelg River, Surry River, Fitzroy River, Yambuk Lake, Moyne River, Merri River and Hopkins River. Glenelg spiny crayfish will be assessed in a fishery independent sampling program that builds on past monitoring sites (of other independent research projects) to build a picture of the stock status over time. An application to fund this project will be made through the Regional Catchment Investment Plan with an in-kind contribution from DPI. As described in Strategy 3, habitat and environmental conditions are critical to the production of key fisheries resources. Fisheries Victoria can play a fishery advocacy role by providing information on the environmental and habitat needs of key recreational target species to other agencies to inform their policy and investment processes. The habitat and environmental needs required to sustain the production (spawning, recruitment, survival, growth and movement) of black bream, mulloway and estuary perch will be assessed in a literature review. Gaps identified in the literature review may be addressed in future research and monitoring programs. Funding of research and monitoring programs for the GHFMP will be sought from the Fisheries Victoria program budget, the Recreational Fishing Licence Trust Account and through the GHCMA Regional Catchment Investment Plan. Table 2 provides a summary of research and monitoring projects and information on costs and responsible agencies. The waterways of the Glenelg Hopkins Fishery are, for the purposes of the Act, classed as Victorian inland waters. Unless exempted, anglers are required to hold a Recreational Fishing Licence (RFL) to recreationally fish these waters. The requirement for an RFL applies to the taking of or attempting to take, any species of fish by any method. The licence covers other activities such as bait collection, gathering shellfish, yabby fishing, prawning and spear fishing. Details of entitlements under this licence and other important information for anglers can be found in the Victorian Recreational Fishing Guide (www.depi.vic.gov.au/fishing-and-hunting). There is a high level of community expectation that fishery resources will be maintained at sustainable levels and that the aquatic habitats that support them will be protected. The Act and the associated Regulations provide the legislative framework for ensuring the protection of those resources. Successful fisheries management in Victoria depends heavily on achieving optimal levels of compliance with legislation. This is best achieved through a combination of maximising voluntary compliance and creating a deterrent effect. DPI, through Fisheries Victoria and its regional Fisheries staff, is responsible for the delivery of a range of services associated with fisheries compliance. These services range from detection and apprehension of people fishing illegally, through to education and information dissemination designed to maximise voluntary compliance. For the Glenelg Hopkins Fishery, these compliance services are delivered as part of DPI's South West Fisheries program. Fisheries staff providing these services in the Glenelg Hopkins Fishery area are based at Warrnambool, Portland and Horsham. There is a growing level of awareness within the community that through the act of harvesting our natural resources, we can have a direct effect upon the condition of the resource. As the environment comes under pressure from the effects of coastal development, fish stocks may also come under further pressure from increased recreational fishing activity. For some species, specific management arrangements are in place that may include catch and size limits and the closure of particular areas to the use of certain types of fishing equipment. High levels of voluntary compliance require effective education and community awareness programs which promote and support close and ongoing cooperation between fishers and DPI, a high level of community awareness and understanding about management objectives and strategies. Perhaps most importantly, it requires a sense of shared responsibility for maintaining healthy fisheries for future generations. Fisheries Victoria recognises the need to maintain a high standard of education and awareness programs relating to the region's waterways. Fisheries Victoria will continue to provide these services consistent with its statewide education and enforcement program. Fisheries Victoria's programs are often complemented by the community education activities of other organisations, including Catchment Management Authorities, angling clubs and Fishcare Victoria. Fishcare Victoria's programs aim to foster responsible fishing practices and care for aquatic environments. DPI's fisheries community education and awareness programs are complemented and supported by its efforts to ensure effective deterrents to potential offenders through its fisheries enforcement operations targeting substantial and deliberate breaches of the regulations. Land and water-based patrols by authorised Fisheries Officers provide important opportunities for communication and engagement with active fishers, as well as discouraging illegal activities by providing a physical presence. The issuing of penalty notices can also act as a deterrent to illegal activities. DPI operates a 24-hour, 7-day a week, statewide offence reporting service - 13 FISH (call 13 3474). Users of waterways across the Glenelg Hopkins Fishery who are concerned about suspected illegal activities are encouraged to report these matters on the service. consider DSE's Action Statement on Glenelg spiny crayfish during prioritisation processes for future education and compliance programs. 90% compliance with fishing controls achieved. Compliance programs are adequately implemented to ensure ongoing access to recreational angling species. The GHFMP provides direction for recreational fisheries management for the Glenelg Hopkins Fishery. Initially most fishery management measures for the Glenelg Hopkins Fishery will remain unchanged while the focus is on establishing programs to monitor the status of key target species and identify key environmental threats to fisheries resources. If information from these programs indicates a need to alter fishery management arrangements in the future to ensure sustainable use or to meet changing demands for recreational fishing opportunities, then changes will be considered in consultation with stakeholders. Any proposed changes to fisheries regulations may be subject to a Regulatory Impact Statement (RIS) process under the provisions of theSubordinate Legislation Act 1994, which includes extensive consultation with stakeholders. The GHFMP will come into effect following a declaration by the Minister via a notice in the Government Gazette and will be made available to the public through the internet and as a published document. The Glenelg Hopkins Reference Group will be established to work with DPI to deliver the desired management outcomes for the Glenelg Hopkins Fishery. It is proposed that the Glenelg Hopkins Reference Group include representatives nominated by VRFish, Fisheries Victoria and the GHCMA. Other groups or individuals may be engaged by the group as required. The role of the group is to advise the Executive Director, Fisheries Victoria, DPI with respect to the coordination of activities and projects in support of the GHFMP actions, strategies and objectives, including monitoring implementation of the GHFMP. The group will also facilitate partnerships with other agencies to develop programs, and review the outcomes of research and provide recommendations on future research directions. Fisheries Victoria will establish the group within the first twelve months of declaring the management plan. Terms of reference to guide the group will be issued by the Executive Director, Fisheries Victoria, DPI. Ongoing implementation of the GHFMP will require action by DPI in conjunction with recreational fishers, VRFish and other stakeholders to establish the required fishery monitoring and research programs, to carry out day-to-day management activities, and to ensure compliance with fishery management arrangements. Key actions required to facilitate implementation of this management plan are summarised in Table 1. An annual progress report will be prepared by Fisheries Victoria on the implementation of the GHFMP and will provide details of progress against key performance indicators. Annual report will be available on the DPI website at www.depi.vic.gov.au/fishing-and-hunting/. Costs of establishing the required fishery monitoring and research programs, and potential funding sources, are described in Table 2 in the "Research and Monitoring" section of the GHFMP. Costs for implementation of fisheries compliance activities across the Glenelg Hopkins Fishery will be met within the DPI Fisheries Program budget allocation. For further information on this management plan, comment on its implementation or recreational fishing in general, contact the Department of Primary Industries Customer Service Centre telephone 136 186 or visit the Department's web site at www.depi.vic.gov.au/fishing-and-hunting/. For further information on the activities of VRFish visit the VRFish web site at www.vrfish.com.au. Allen, GR 1989, Freshwater fishes of Australia, TFH Publications Inc. Brookvale. Butcher, AD 1945, Conservation of the bream fishery, Fisheries and Game Department. Victorian Fisheries Pamphlet 1. Cadwallader, PL & Backhouse, GN 1983, A guide to the freshwater fish of Victoria, Victorian Government Publishing Office, Melbourne. pp. 249. Cashmore, S, Conron, S & Knuckey, I (eds) 2000, Black Bream - 1998, Complied by the Bay and Inlet Fisheries Stock Assessment Group. Fisheries Victoria Assessment Report No. 24. (Marine and Freshwater Resources Institute, Queenscliff). Chubb, CF, Potter, IC, Grant, CJ, Lenanton, RCJ & Wallace, J 1981, 'Age structure, growth rates and movements of Sea Mullet, Mugil cephalus L., and yellow-eye mullet, Aldrichetta forsteri (Valenciennes), in the Swan-Avon River System, Western Australia', Australian Journal of Marine and Freshwater Research, vol. 32, pp. 605-628. Department of Agriculture Fisheries Forestry 2005, Recreational Fishing Community Grants Programme: Guide and Application Form, Department of Agriculture, Fisheries & Forestry, Canberra. Department of Natural Resources & Environment 2002a, Victorian Eel Fishery Management Plan, Department of Natural Resources and Environment, Victoria. Department of Natural Resources & Environment 2002, Victorian Pest Management - framework for action, Department of Natural Resources & Environment, Melbourne. Department of Primary Industries 2003, Guidelines for Assessing the Translocation of Live Aquatic Organisms in Victoria, Completed by the Victorian Aquatic Organisms Translocation Guidelines Steering Committee. DPI, Melbourne. Department of Primary Industries 2003a, Freshwater Fish of Victoria - Blackfish, Fisheries Note, Melbourne, Victoria. Department of Sustainability & Environment 2005, Action Statement - Glenelg spiny crayfish. Action Statement 184, Melbourne, Victoria. Edgar, GJ, Hammond, LS & Watson, GF 1993, Consequences for commercial fisheries of loss of seagrass beds in southern Australia. Fisheries Research and Development Corporation Report 88/91, p. 129. Fletcher, WJ, Chesson, J, Fisher, M, Sainsbury, KJ, Hundloe, T, Smith, ADM & Whitworth, B 2002, National ESD reporting framework for Australian Fisheries: The "How To" guide for wild capture fisheries. Fisheries Research and Development Corporation Project 2000/145, Canberra. Glenelg Hopkins Catchment Management Authority 2000, Glenelg Hopkins Weed Management Plan, Glenelg Hopkins Catchment Management Authority, Hamilton, Victoria. Glenelg Hopkins Catchment Management Authority 2003, Glenelg Hopkins RegionalCatchment Strategy 2003-2007, Glenelg Hopkins Catchment Management Authority, Hamilton, Victoria. Glenelg Hopkins Catchment Management Authority 2004a, Yambuk Lake and Estuary Management Plan, Glenelg Hopkins Catchment Management Authority, Hamilton, Victoria. Glenelg Hopkins Catchment Management Authority 2004, River Health Strategy 2004- 2009, Glenelg Hopkins Catchment Management Authority, Hamilton, Victoria. Glenelg Hopkins Catchment Management Authority 2005, The sensitive Surry - an estuary in crisis, Hamilton, Victoria. Glenelg Hopkins Catchment Management Authority 2006, Draft Glenelg Basin Sand Management Plan, Glenelg Hopkins Catchment Management Authority, Hamilton, Victoria. Gunthorpe, L & Hamer, P (eds) 2000, Western Port Bay fish habitats - 1998, Compiled by the Fish Habitat Assessment Group, Fisheries Victoria Assessment Report No. 22, Fisheries Victoria, East Melbourne. Hall, DN 1984, Commercial Fishery Situation Report: Lake Tyers, Gippsland, Commercial Fisheries Report No. 11, Department of Conservation, Forests and Lands - Fisheries and Wildlife Service. Harris, JA 1968, 'The yellow-eye mullet. Age structure, growth rate and spawning cycle of a population of yellow-eye mullet, Aldrichetta forsteri (Cuv. And Val.) from the Coorong lagoon, South Australia', Transactions of the Royal Society of South Australia, vol. 92, pp. 37- 50. Honan, JA 1998, 'Egg and juvenile development of the Australian freshwater crayfish, Euastacus bispinosis Clark (Decapoda; Parastacidae)', Proceedings of Linnean Society of New South Wales, vol. 119, pp. 37-54. Honan, JA, & Mitchell, BD 1995a, 'Reproduction of Euastacus bisponsis Clark (Decapoda: Parastaciadae), and trends in the reproductive characteristics of freshwater crayfish', Marine and Freshwater Research, vol. 46, pp. 485-99. Honan, JA & Mitchell, BD 1995b, 'Growth of larger freshwater crayfish', Eustacus bispinosus. Freshwater Crayfish, vol. 10, pp. 118-131. Honan, JA & Mitchell, BD 1995c, "Growth of larger freshwater crayfish", Eustacus bispinosus. Freshwater Crayfish, vol. 10, pp. 118-131. Honan, JA 2004, Habitats of Glenelg spiny crayfish (Euastacus Bispinosus) in the Glenleg River Drainage, Prepared for the Glenelg Hopkins Catchment Management Authority, Hamilton, Victoria. Horwitz, P 1990, "A taxonomic revision of species in the freshwater crayfish genus Engaeus Erichson (Decapoda: Parastacidae)", Invertebrate Taxonomy, vol. 4, pp. 427-614. Jenkins, GP, Watson, GF & LS, Hammond, LS, 1993, 'Patterns of utilisation of seagrass (Heterozostera) dominated habitats as nursery areas by commercially important fish', Victorian Institute of Marine Sciences, vol. 19, p. 100. Jenkins, GP, Watson, GF, Hammond, LS, Black, KP Wheatley, MJ, & Shaw, C 1996 Importance of shallow water, reef-algal habitats as nursery areas for commercial fish from south-eastern Australia - Final report, Fisheries Research and Development Corporation Project 92/44, pp. 166. Kailola, PJ, Williams, MJ, Stewart, PC, Reichelt, RE, McNee, A & Grieve, C 1993, Australian fisheries resources, Bureau of Resource Sciences and the Fisheries Reserch and Development Corporation, Canberra. Koehn, JD 1987, Artificial habitat increases abundance of two-spined blackfish Gadiopsis bisponsis in Ovens river, Victoria, Department of Conservation, Forests and Lands, Arthur Rylah Institute for Environmental Research, Heidelberg, Victoria. Koehn, JD & O'Connor, WG 1990, Biological Information for Management of native Freshwater Fish in Victoria, Department of Conservation and Environment, Melbourne. Marine Safety Victoria 2005, Boating safety and facilities program 2005-06, Marine Safety Victoria, Melbourne. McDowall, R 1996, Freshwater Fishes of South Eastern Australia, Reed Books, Chatswood New South Wales. Ministerial Council on Forestry, Fisheries and Aquaculture 1999, National Policy for the Translocation of Live Aquatic Organisms - Issues, Principles and Guidelines for Implementation, Ministerial Council on Forestry, Fisheries and Aquaculture. Mitchell, P 1990, The Environmental condition of Victorian streams, Department of Water Resources, Victoria, Melbourne. Ramm, DC 1986, An ecological study of the ichthyoplankton and juvenile fish of the Gippsland Lakes, Victoria, Unpublished PhD thesis, University of Melbourne. 161 pp. Rigby, BA 1982, An ecological study of the estuarine fish assemblage in the Gippsland Lakes, Internal Report No. 3, Marine Sciences Laboratory, Ministry for Conservation, Victoria. Robertson, AI 1978, Trophic interactions among the macrofauna of an eelgrass community, PhD Thesis, Dept. Of Zoology, University of Melbourne. Victoria. Southern Rural Water 1998, Streamflow Management Plan - Explanatory Notes for the Meri River, Southern Rural Water. Sherwood, JE & Backhouse, GN 1982, Hydrodynamics of salt wedge estuaries: implications for successful spawning of black bream (Acanthopagrus butcheri) - Report 82/3, Faculty of Applied Science and Technology Research Warrnambool Institute of Advanced Education. Thompson, JM 1957, The food of Western Australian estuarine fishes, Western Australian Department of Fisheries, Fisheries Bulletin 7 p. 16. VRFish 2004a, VRFish Policy Paper - Boat Launching Facilities, VRFish, Victoria. VRFish 2004, VRFish Policy Paper - Access For Recreational Fishing, VRFish, Victoria. Wager, R & Jackson, P 1993, The Action Plan for Australian Freshwater Fishes, Australian Nature Conservation Agency, Canberra. Western Coastal Board 2002, Coastal and Marine Planning Program, South West Estuaries Coastal Action Plan, Western Coastal Board, Victoria. Western Coastal Board 2002, Coastal and Marine Planning Program, South West Victoria Regional Coastal Action Plan, Western Coastal Board,Victoria. Williams, NJ 1970, A comparison of the two species of the genus Percalates Ramsay and Ogilby (Percomorphi : Macquariidae), and their taxonomy, Chief Secretary's Department, New South Wales State Fisheries Research Bulletin no. 11. Gunthorpe, Leanne 2000, personal communications from Western Minor Inlets Habitat Assessment Group. Martin, Neil 2005, personal communications from Glenelg Hopkins Fishery Management Plan Steering Committee. Age class - fish of a particular species that were spawned in the same year. Anthropogenic - resulting from the influence of human beings on natural processes. Ecologically Sustainable Development - Using, conserving and enhancing the community's resources so that ecological processes, on which life depends, are maintained, and the total quality of life, now and in the future, can be increased. Estuary - the coastal section of a waterway where freshwaters from the catchment mix with saltwater from the sea. Objective - a longer-term description of what we are trying to achieve through the implementation of the management plan. Performance indicator - used as a means of tracking progress of implementing actions on an ongoing (usually annual) basis. Target - provides a longer-term measure for the Objectives of the GHFMP. Targets should be achieved through the successful implementation of the GHFMP. Production (of fish species) - refers to biological processes, such as spawning, recruitment, survival, growth and movement, that drive changes in the abundance and distribution of a species. Research angler diarist - a monitoring program that uses highly skilled anglers to sample fish populations using prescribed methods. Information is collected on catch and effort trends and stock structure. Stratification - a process where layers of water are separated within the water column because of differences in salinity or temperature. Translocation - the deliberate human-assisted movement of live aquatic organism using associated transport media. Eleven species or families of fish have been identified as being commonly encountered or observed by recreational fishers of the estuaries in the Glenelg Hopkins Fishery. The main recreational target species in these estuaries are black bream, estuary perch and mulloway. Yellow-eye mullet and Australian salmon are common by-catch species. In total, it is likely that over forty species of fish reside or spend time in the region's estuaries. I, Bob Cameron, Minister for Agriculture, pursuant to section 28(2) of the Fisheries Act 1995 (the Act), issue the following guidelines with respect to the preparation of a Fishery Management Plan for the inland Glenelg Hopkins region. Fisheries Victoria of the Department of Primary Industries will be responsible for the preparation of the Fishery Management Plan. The plan must be consistent with the objectives of the Act. The Fisheries Co-management Council will oversee the process for the preparation of the Fishery Management Plan. The plan must comply with Part 3 of the Act. The Fishery Management Plan will be prepared with input from all major affected stakeholder groups, including recreational fishing interests and Indigenous interests. The inland Glenelg Hopkins region includes the Glenelg Basin, Portland Basin and Hopkins Basin as defined by the Glenelg Hopkins Catchment Management Authority. The Fishery Management Plan will identify factors, including habitat and water management issues, impacting fisheries resources. The Fishery Management Plan may identify opportunities to maintain or enhance the recreational fishing experience. The Fishery Management Plan may specify appropriate management controls with regard to recreational fishing and may recommend options to assist in managing related activities. The Fishery Management Plan will identify research and information needs to support the sustainable management of fisheries resources. The Fishery Management Plan will include processes for reporting to the Victorian community on achievements of the Plan.